These meatballs are great appetizers for cocktail party as they are a side dish or lunch. Also, they are good on their own and not fried if you want a healthier spin. 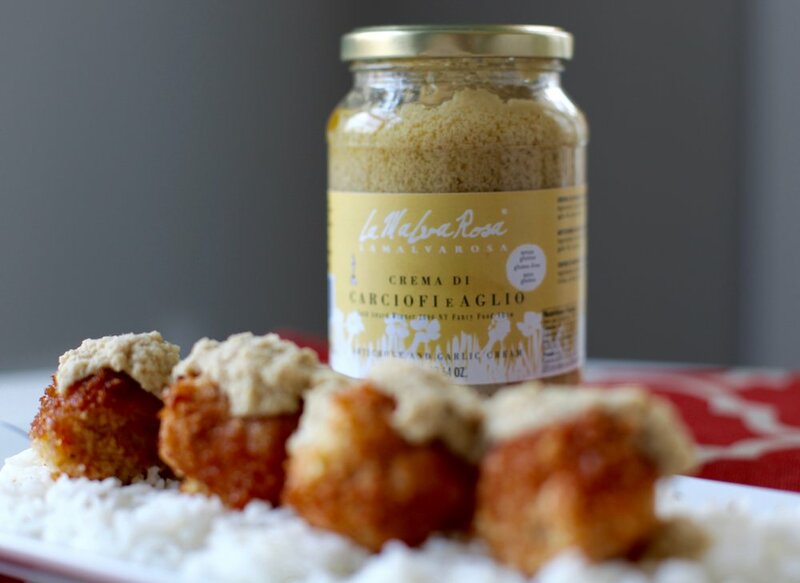 I love topping them off with this new product I found from Bottega Mediterranea. It is called La Malva Rosa Crema e Carciofi e Aglio. What is so awesome about their products is the ingredients are sourced from small artisans and farms in the Mediterranean. Even better there are no artificial ingredients or chemicals. Everyone loves the farm to table concept, and how great is it to get that experience from the Mediterranean to here! 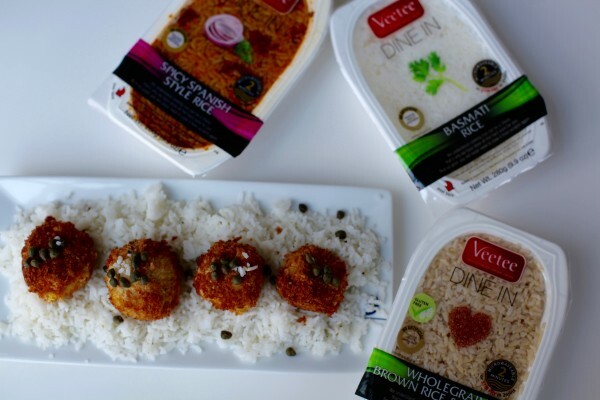 Another great product to use along with this recipe is from Veetee Rice. After spending the time making the meatballs is great to be able to make a side in about two minutes flat. 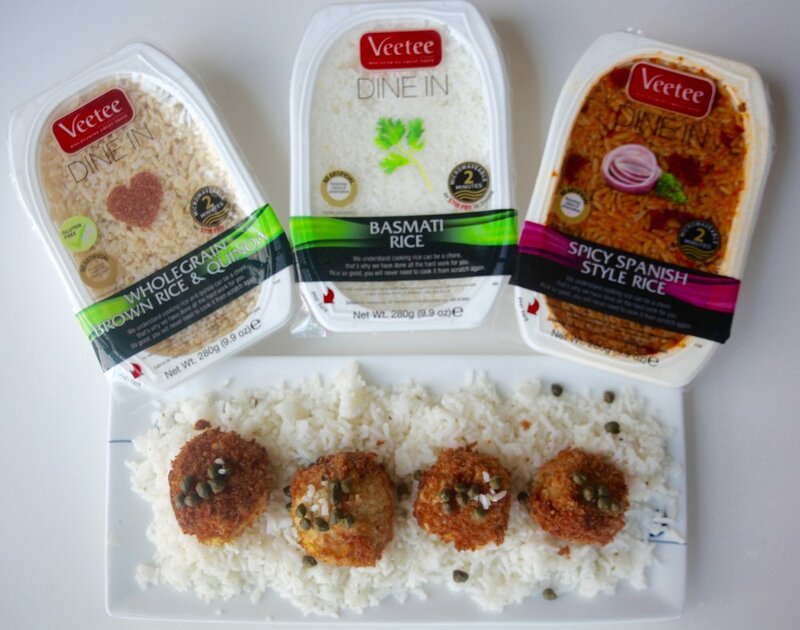 Veetee has a range of products to suit every taste. I love the whole grain brown rice and the Spanish style! Stay tuned for a rice bowl recipe coming next week! In a large mixing bowl combine the ground chicken, egg, lemon zest, parsley, garlic, breadcrumbs, capers, salt and pepper. I use my hands! I work everything together for about 5 minutes or so until everything is mixed together. Preheat the oven to 325 degrees. Then roll portions of the ground chicken mixture into 1 inch balls and set aside. In separate shallow bowls prepare the panko, egg, and flour. Working with 1 meatball at a time, dredge in flour, then dip in egg; allow excess to drip back into bowl. Roll meatball in panko, pressing gently to coat. Set aside. Attach deep-fry thermometer to side of a large heavy pot. Pour in oil to a depth of 2". Heat over medium heat until thermometer registers 350°f. Line another baking sheet with parchment. If you don't have a deep fry thermometer you can test the oil by sprinkling some panko crumbs into it. If it pops and sizzles the oil is ready! Working in batches, fry meatballs, turning often, until light golden and crisp, about 1 minute. Transfer the meatballs to your prepared baking sheet. Place in the middle rack of your preheated oven for 20 minutes.